Frank Beddor is a former world champion freestyle skier, film producer (There’s Something About Mary), actor, and stuntman. Beddor is currently the CEO of the production company Automatic Pictures. He co-writes the Hatter M graphic novels. Learn more about his books and read or listen to excerpts at The Looking Glass Wars website. The Looking Glass Wars — (2004-2009) Ages 9-12. Publisher: Alyss, born in Wonderland, is destined to be a warrior queen. After a bloody coup topples the Heart regime, Alyss is exiled to another world entirely, where she is adopted into the Liddell family, renamed Alice and befriended by Lewis Carroll. At age 20 she returns to Wonderland to regain her sceptre, battle Redd and lead Wonderland into its next golden age of imagination. This is a book for fans of fantasy and of the bestselling “ology” books, for Lewis Carroll scholars, and especially for young girls in search of a fresh, new, princess story. The Looking Glass Wars, somewhat a reimagining of Alice In Wonderland, has its moments but is generally weak throughout. It's a "multi-platform" concept, which means along with the requisite trilogy (Seeing Redd is out currently as book two), there are graphic novels and a planned movie and video game. What does all this mean? Perhaps a wonderfully immersive experience in the world if one buys all the stuff. But if you're like me and just want to enjoy a book, you're a bit out of luck. For me, Alice In Wonderland is one of those unforgettable tales that has been imprinted onto my imagination for as long as I can remember, alongside such classics as The Wizard of Oz and Star Wars, and remains one of the most beloved stories of our time. So when I heard about Frank Beddor’s The Looking Glass Wars, which supposedly told the true story of Alice Liddell and a Wonderland that was real, I was definitely intrigued and picked up a copy. 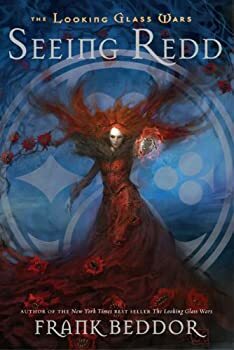 Even though the book was somewhat aimed toward a younger audience and was a little rough around the edges writing-wise, I enjoyed The Looking Glass Wars. 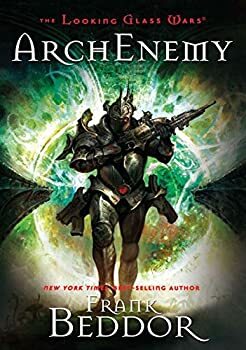 As Alyss searches wildly for the solution to the disaster that has engulfed her Queendom, Arch declares himself King of Wonderland. Meanwhile, deep within the Valley of Mushrooms, the Caterpillar Oracles issue this prophecy: “Action shall be taken to ensure the safety of the Heart Crystal. For Everqueen.” But who is Everqueen? Hatter M: The Looking Glass Wars — (2008-2010) Ages 9-12. Graphic novels. With Liz Cavalier. Publisher: Put to rest any delusions or disinformation you have of the tea-guzzling madman of faux literary history and prepare to expand your consciousness as the saga of Hatter Madigan and his relentless search for the lost Princess of Wonderland unfolds in Volume 1 of the Hatter M graphic novel series! 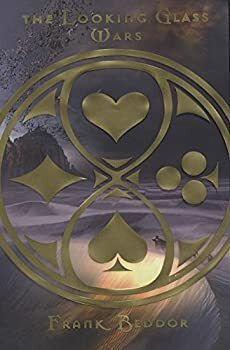 In Frank Beddor’s bestselling The Looking Glass Wars, Royal Bodyguard Hatter Madigan was ordered by Queen Genevieve to take Princess Alyss and leave Wonderland after a bloody palace coup staged by the murderous Redd. But while escaping through the Pool of Tears (the portal connecting Wonderland to our world) crushing centrifugal force pulled them apart, and Alyss was lost. In this first volume of the geo-graphic parallel adventure trilogy, Hatter finds himself in Paris, France in the year 1859 shockingly separated from the child he had been sworn to protect. Hatter must now embark upon a non-stop quest, crisscrossing the globe for 13 years in search of his lost Princess. Mad With Wonder is the second geo-graphic novel that chronicles Hatter Madigan’s 13-year search for Princess Alyss, who was lost on Earth after escaping through the Pool of Tears. 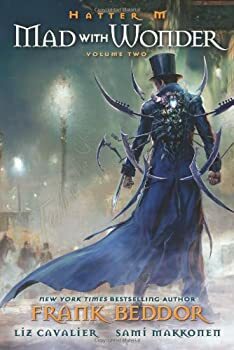 This time around, Madigan’s quest takes him to America during the Civil War and finds the Milliner crossing paths with circus freaks, a group of outlaws, Mr. Van de Skülle, a child gifted with the power of healing, and a vampire as well as being imprisoned in an insane asylum.